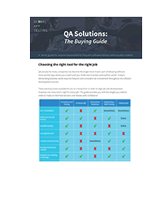 Are you struggling to decide on a QA solution? There comes a time in almost every companies life where decisions must be made about quality and software testing. Whether you are a high-growth startup looking to dip your toes into QA for the first time or are a world leader in your industry, you need to know which solutions deliver the best bang for the buck. These results will help you make an informed decision and select the right QA solution for your company. The guide covers: crowdsourced testing, in-house QA, automation solutions, beta testing and outsource testing.